This vintage real photo postcard features two pretty women wearing their national costume. The portrait offers more questions than answers. What country does this attire represent? Slovakia? Russia? Is the woman in the lighter colored dress, a bride? Hopefully, a visitor to the Cabinet Card Gallery, will offer the answer to these questions. At the very least, maybe a visitor will be able to make an educated guess in regard to the women’s nationality. This photo postcard is in very good condition (see scans). Three adorable young siblings pose for their portrait at the studio of Antonin Schilder in Roudnici, Czechoslovakia. The kids are wearing adorable expressions and are beautifully dressed. 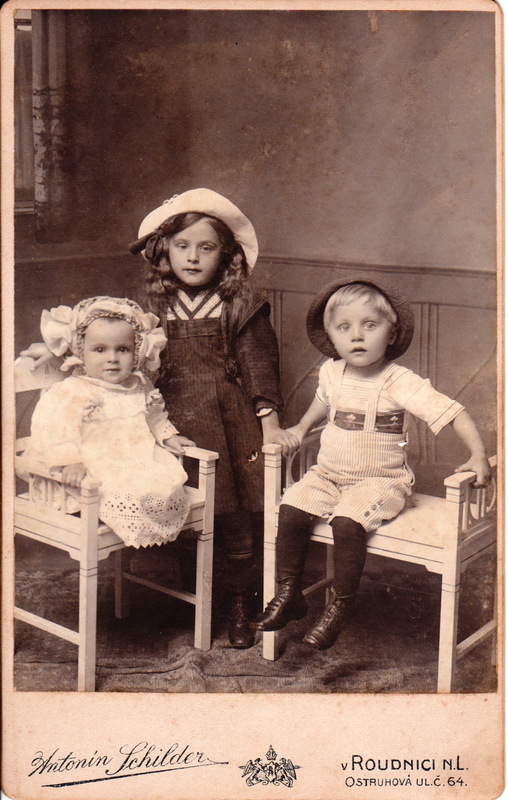 The child seated on the right in the image looks ready to pop out of his seat. If “cool” was a slang word used in the early 1900’s, than this is one very “cool” couple. Both subjects are very expressive as they pose for their wedding portrait at Wilhelm Richter’s studio in Karbitz, Czechoslovakia. 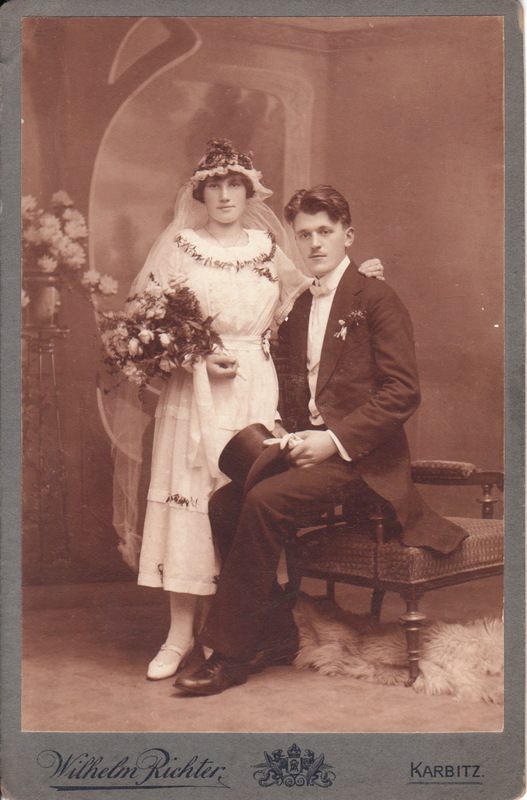 The bride is holding a large bouquet of flowers and the the groom is wearing a flower on his lapel. A written notation on the reverse of the photograph indicates that the image was produced in 1920. 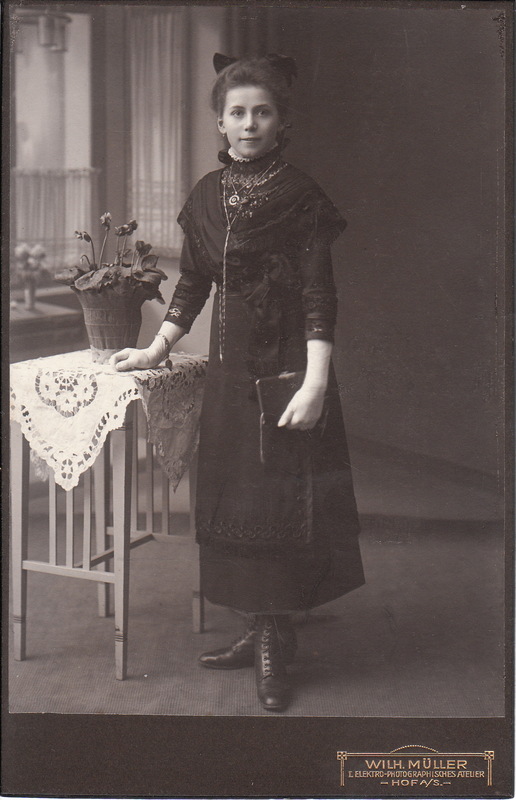 This cabinet card is a portrait of a pretty woman in Franzensbad, Czechoslovakia. 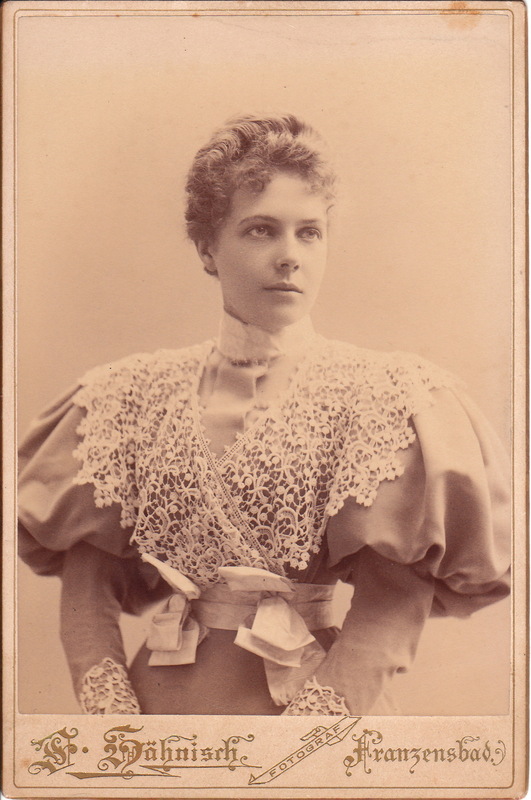 The woman is well dressed and her dress includes a high lace collar, lace sleeves and features a ribbon around her waist. Printed on the reverse of the cabinet card is the name “Bernard Wachtl”. Wachtl was an Austrian lithographer whose printing firm was located in Vienna. He was active mainly in the latter half of the 19th century. He designed and printed the logos of photographic studios that were printed on the verso of cabinet cards. To view other work by Wachtl, click on the category of Lithographer: Bernard Wachtl) The photographer of this image is F. Hahnisch. A pretty girl poses for her portrait at the Wilhelm Muller studio in Hof, Germany. Hof is a city in Bavaria, Germany. The city is located near the border with Czechoslovakia. This photograph may be a confirmation or communion picture. She appears to be a teenager and is very nicely dressed. She is wearing two necklaces, earrings, and a bracelet with a charm. She is also wearing a bow in her hair. She is holding something in her left hand, and what it is, isn’t exactly clear. The object appears to be a book or a purse. Perhaps a cabinet card gallery visitor can identify what it is that she is holding. One thing that is certain is that the girl in this photograph has a wonderful smile. 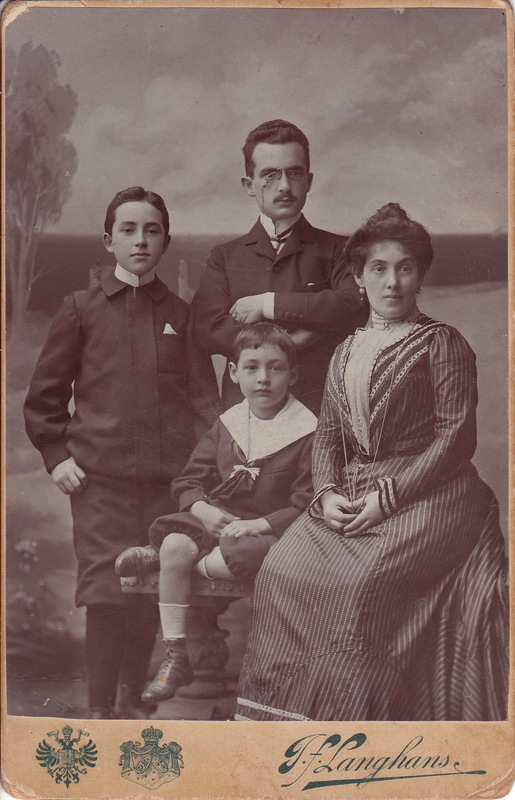 This cabinet card features an attractive family posing for their portrait at the studio of J. F. Langhans in Prague, Czechlosvakia. Mother, father, and their two sons are all beautifully dressed. Father appears to be small of stature and looks quite austere with his hands folded across his chest and his stern facial expression. The children in this photograph seem significantly more relaxed than their parents. Take note of the style of father’s eye glasses Jan Langhans (1851-1926) is the best known figure in Czech photography and his gallery is still in existence. There is a wealth of information about Langhans online at the “Langhans Archive”. The site provides biographical and historical information as well as the “Gallery of Personalities”. The gallery has photographs of many prominent Czech citizens as well as well known visitors to Czechoslovakia.. These portraits date from 1890 through 1948. The studio was founded by Jan Langhans, who was a food chemist by training but developed a passion for photography. He opened his first studio in 1876 and was the preeminent portrait photographer of the region. He opened a number of branch studios throughout Czechoslovakia. He photographed many celebrities and aristocrats. After World War I the gallery possessed over a million negatives. He gave the studio to his daughter Marie and her husband Viktor Meisner. After World War II, his grandson Viktor Meisner took over the studio. In 1948, soon after the Communist take-over, the studio was nationalized and most of the negatives were destroyed. Fortunately, more negatives were discovered and they comprise the Gallery’s current collection. To view other photographs by Langhans, click on the category “Photographer: Langhans”.